Poland According to ye Newest Observations by Herman Moll Geographer. 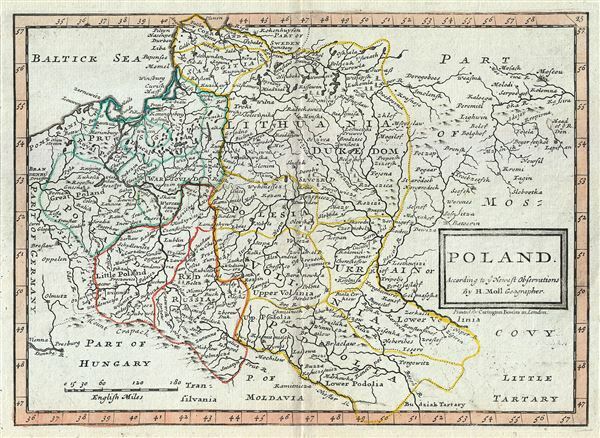 This is a beautiful 1784 map of Poland by Herman Moll, issued by Carrington Bowles. The map covers Poland and Lithuania as well as parts of Germany, the Russian Empire, Hungary, Transylvania (Romania), and Latvia. Several important towns, rivers, lakes and other topographic features are noted throughout, with mountains rendered in profile. Despite the date of issue, this map illustrates Poland in the waning days of the Polish-Lithuanian Commonwealth, just prior to the 1772 First Partition of the Commonwealth. In 1764 Stanislaw August Poniatowski was elevated by election to become King of Poland. This worldly and refined ruler attempted various reforms intended to preserve the failing Polish state, but found himself increasingly subservient to Tsarina Catherina II of Russia. The Bar Confederation of 1768, a rebellion against increasingly Russian influence over Polish politics, led to the First Partition of the Commonwealth, a permanent annexation of Polish territory by its more powerful neighbors. Subsequent partitions in 1793 and 1795, would eventually lead to the disintegration of the Polish state, though it was later reconstituted during the Napoleonic Wars. This map was created by Herman Moll and issued by Carrington Bowles in London in 1784.